Today our church started a 10 week study for everyone, at all levels, based on the book “The Story: The Bible as One Continuing Story of God and His People” by Max Lucado (@MaxLucado) and Randy Frazee (@RandyFrazee). Adult Sunday School classes are studying “The Story,” as are our youth and children in Kids Ministries. Our pastors are preaching on the same chapter each week which is being studied in Sunday School. We are using this study to bring more unity to our congregation as our pastor nominating committee continues its search for a new senior pastor, which we hope will bear fruit later this year. The Kindle eBook version of “The Story” is just $1.99, so that’s the one Shelly and I ordered to read on our iPads. As I’m trying to do with more frequency, I used the app ProCreate on my iPad and an Adonit Jot Pro stylus to create a sermon sketchnote today during the service. I’m continuing to add my sketchnotes to this Flickr album. I also exported the sketchnote from ProCreate as a video, imported it into iMovie for iPad, and slowed it down to 50% speed before adding some audio narration. The final video is 83 seconds long. 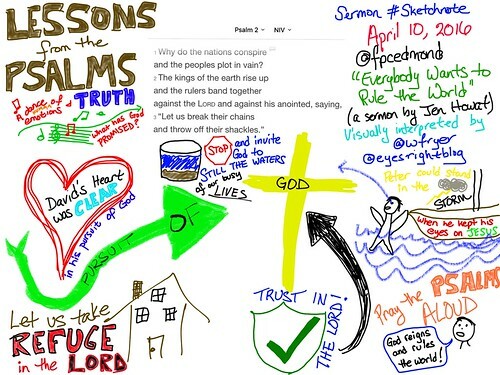 I added this video to a new YouTube playlist of my narrated sermon sketchnotes. This is the eighth one I’ve created and published to Youtube. For more information about using media to share your journey of discipleship with Jesus, see the project website for “Digital Witness 4 Jesus Christ” (www.dw4jc.com). I will have an opportunity tomorrow to share an eight minute chapel talk with our upper division and middle division students. These are the slides and the message I plan to share. It is both an honor and a blessing to have an opportunity today to share a few words with you in this beautiful chapel, at our wonderful school. As a relative newcomer to our Casady family, I am still very much in awe of the amazing opportunities we have together as a community to not only learn and work, but also worship and grow spiritually. When I was growing up and going to elementary, middle and high school, my family moved five times. I lived in Arizona, Colorado, Alabama, Texas, Mississippi, and Kansas before I finished the sixth grade, because my father was in the Air Force and was assigned to a new base every three to four years. Whenever we move to a new place and find ourselves in new surroundings, we slowly get used to a “new normal.” There is so much to be thankful for as a member of our Casady community, and I give God both thanks and praise for these blessings. This morning I’d like to talk to with you about ideas that are both basic but also revolutionary. This is the reality of God’s existence, and the invitation that God extends to us through his Son, Jesus Christ, to have a relationship with him. This may sound like an overly simplistic message: After all, we are here in a Christian chapel, and some people might assume that everyone here acknowledges God’s reality and knows his only begotten son, Jesus Christ. In my life, however, I’ve learned that just because someone grows up in the church, and regularly attends church services, does not necessarily mean they believe God is real, or that they acknowledge and know his son, Jesus Christ. Thanks be to God for this reading of his Word. As our human race has developed more knowledge and named more of the amazing dynamics which we find on our marvelous planet, some people have and continue to believe that “our need” and “the space” for God in our world has diminished or even gone away altogether. I stand before you as a witness today, however, to tell you that perspective on God is mistaken. God is very real and very present today, as he was yesterday, and as he will be tomorrow. His son, Jesus Christ, stands at the door of our hearts this day, this morning, even right now as I share these words with you, knocking and asking to come in. While God is always present around us, sometimes we are too busy or just don’t have our eyes open to see him and the work he is doing. I’d like to close my comments today by telling you a short story, when I dramatically witnessed both the reality and the saving power of God. After I graduated from the US Air Force Academy in Colorado Springs, I lived and studied for a year in Mexico City before starting pilot training in Lubbock, Texas. I had flown about 40 hours in the T-37, which is a twin engine sub-sonic jet aircraft, when I had my first opportunity to fly solo (by myself) to the area where we were authorized to perform a variety of aerobatic maneuvers. These included things like an aelieron roll, a split – S, an immelman, a clover leaf, and other maneuvers that I could explain better if I used my hands and you could see them clearly. I’ll summarize by saying it was very cool to be able to fly a jet by yourself up to an area of empty airspace over the plains of West Texas, between 10,000 and 25,000 feet above sea level, and have about 20 minutes worth of jet fuel to burn doing aerobatic maneuvers. Once I got into my area on my first solo flight away from the air base’s traffic pattern, I decided that I wanted to try doing three aelieron rolls in a row. One aelieron roll was a permitted procedure, but more than one in a row in a T-37 was not. In other more aerodynamic aircraft, you can simply push the stick to one side of the cockpit and do as many rolls as you want to without losing much altitude or airspeed. In the T-37, however, it was necessary to pull your nose up 30 degrees before doing a roll, because the nose dropped during the procedure. What ended up happening to me on a February day in 1994 when I tried three consecutive aileron rolls was that I got into a nose low, inverted dive and found myself zooming toward the ground at over 250 knots of airspeed. Instead of rolling wings level and pulling back to recover, I pulled back my throttles and pulled back on my control stick. This led to a dive recovery in which I exceeded 9 G’s. I did not black out, but I did completely lose my vision as the G forces pulled the blood down out of my head. I saw my airspeed going over 250 as I lost vision, and as I applied back pressure to try and recover my plane from the dive I prayed to God that he would save me. No one actually knows how close to the ground I came in recovering my aircraft that day, because of the delay in the radar sweep from the air traffic control center monitoring aircraft in that area. What we do know is that I was well below 10,000 feet, and the G meter on my aircraft was maxed out to over 9 G’s. The maximum allowable G’s for T-37 pilots is 6.67 G’s. I landed my aircraft, did not zero out the G meter, and reported what happened knowing that could very well have been my last flight in pilot training. It was not, I was able to continue flying and solo again to the area several weeks later, but I certainly did not try doing three consecutive aelieron rolls in that airplane again. I am sharing a brief part of that dramatic story with you today, because it clearly dramatized to me the reality of God and how he is able to answer our prayers when we call out to him for help. In your life, if you have not already, you are going to study and work with some extremely smart people who do not believe in God or that he even exists. I am a witness who can tell you that God is not only real, but He’s present with us right now, right here, today. Whether you find yourself now in a difficult struggle or just another “normal” day of school, God is available and wants to be the co-pilot of your life. I encourage you to seek God and pray to Him this day, not only in the difficult times, but in the good ones as well. Thanks be to God for his grace, his love to us, his children who do not deserve it, and for his son who came to teach us how to live. God bless each one of you this day. May today be filled with kindness and joy, and may we each share the love of God with each person we meet. 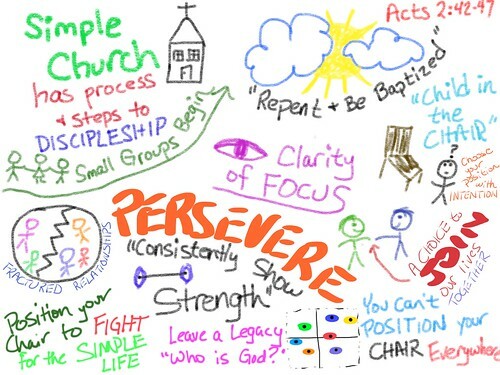 I created this sketchnote during a sermon shared by Jen Howat at our church on August 22, 2015. The focus verses for her sermon, titled “The Simple Life,” were Acts 2:42-47. This is from the Amplified Bible. This is a narrated sketchnote I created by importing the video of my sketchnote, from Procreate, into iMovie. I slowed it down four times to give me more time for the narration, which is about two minutes long. Today was my first day at our church to use the iPad app ProcreateÂ to create sketchnotes of both our Sunday School lesson and today’s sermon by our senior pastor, Mateen Elass. My friend Carol Anne McGuire (@rockourworld) is an avid sketchnoter each Sunday of sermons at her church in California, and I’m very inspired by her work. 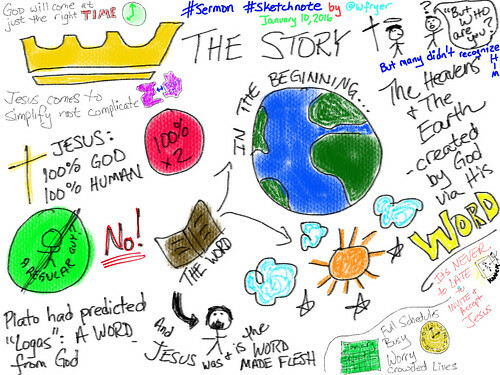 She posts all her sketchnotes (for sermons and other presentations)Â to this Flickr album. I’ve been a fan of the iPad app “Brushes” for years, and created my own sketchnotes for my eBook single and book chapter on “visual notetaking” back in 2013. Unfortunately, however, when Brushes went to verson 3 it was a functional downgrade. The interface got worse, and the ability to export stopmotion-style animationsÂ of drawings asÂ shareable videos was also eliminated. As a result, I’ve been on a quest to find a new iPad app to replace Brushes. Carol Anne recommendedÂ Procreate, and my initial experiences with the app today were superb. I really like it and look forward to learning how to use it more effectively. Keep in mind, before I show you my creations today, that the goal of “sketchnoting” is NOT to create great or compelling art. The purpose is to more deeply process the ideas the sketchnoter is hearing, seeing and experiencing, and create a visual product which can be used later to “re-tell” the main ideas and points of the presentation. 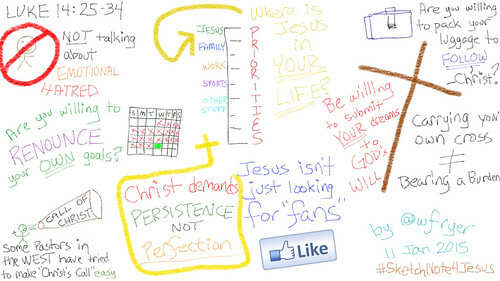 Sketchnotes are also handy to visually represent key ideas and share them on social media, which is critically important in our “attention economy.”Â Today I not only usedÂ ProcreateÂ to create and export static images of my sermon sketchnotes, but I also used it to export video versions which I later narrated using iMovie for iPad. I’ve taught my 4th and 5th grade STEM students the past couple of months how to use iMovie for iPad to narrated theÂ Lego Stopmotion movies they’ve created in our Maker Studio, and those positive experiences led me to try narrating my sketchnotes today. For more information, links and resources about sketchnoting or creating “visual notes,” please see the visual notetaking page of Mapping Media to the Curriculum. Our couples Sunday school class lesson today focused on Romans 14. Here’s my VERY child-like sketchnote. As a partial disclaimer, understand I forgot my stylus at home today so these visuals were drawn with my finger! I also shared a few tweets on my @eyesrightblog Twitter channel during Sunday school class. Here’s my sketchnote ofÂ Mateen Elass‘s sermon this morning, which focused on Luke 14:25-34.